Mercedes-Benz has announced that it has bought a controlling stake in the recently-crowned Formula 1 champions Brawn GP and re-named it Mercedes Grand Prix. Ferrari was first with the F60, then Toyota with the TF109, now McLaren has introduced their new 2009 Formula 1 car to the world, the Vodafone McLaren Mercedes MP4-24. Judging from the pictures, Lewis Hamilton and Heikki Kovalainen look very happy with the design of the new car with huge smiles all around. As expected, the look of the car is very similar to the Ferrari F60 and Toyota TF109. A side-by-side comparison of the MP4-24 and last year’s McLaren F1 car may leave you believing that they are taking a step in the wrong direction aesthetically. Don’t blame McLaren. Channel all your rage towards the regulations. Let’s just hope the sacrifice in looks is forgotten as soon as the boys hit the track. This year’s aerodynamic regulations were framed by the FIA and the Overtaking Working Group (helmed by Vodafone McLaren Mercedes engineering director Paddy Lowe, Ferrari’s Rory Byrne and Renault’s Pat Symonds) which met throughout 2007 in order to address the issues affecting passing in Formula 1. The OWG’s influence can be most clearly seen around the front wing, which has been widened, and the rear wing – which is now more compact. Other factors affecting aerodynamics include the banning of ancillary appendages, the addition of driver-adjustable front-wing flaps and a heavily revised diffuser. The MP4-24’s KERS device has been developed in collaboration with McLaren and Mercedes-Benz HighPerformanceEngines, which has been developing and refining the system for almost two years. The device enables the car to recover energy under braking, store the energy for a lap and release it when the driver presses a button on the steering wheel. With a fully optimised KERS device’s output capped at 400kJ (discharging 80bhp boost for 6.7s per lap), the development team’s primary focus has already shifted to further improving the unit’s integration within the chassis in order to minimise performance loss elsewhere within the package. An optimised KERS package can be expected to deliver a 0.3-0.5s gain per lap. Aston Martin owner and former team principal of BAR and Benetton F1, David Richards, is said to be interested in purchasing the newly for sale Honda F1 team. Richards owns the Prodrive racing team, which races in the World Rally Championship and the 24 Hours of Le Mans. Prodrive attempted to enter into F1 for the 2008 season but ended up having to pull out. The intentions to enter F1 were made clear. Prodrive and Aston are said to have good relationships with Mercedes, who could be a potential engine supplier for Prodrive. Mercedes is already providing engines for 2 other F1 cars besides their own, so extending this offer to another team seems very feasible. Prodrive has also stated that they are relocated to Wroxall, Warwickshire. This could be a possible headquarters for a Prodrive F1 R&D team. The building they will be using will be able to house about 1,000 employees. It appears that all of the ingredients necessary for a successful Formula One team are converging at Prodrive. UK racing fans have had a lot to be proud of lately with young star Lewis Hamilton securing a Formula 1 world championship. The UK’s star cyclist Chris Hoy also brought glory to Britain by winning 3 gold Olympic medals in Beijing. In a country that is crazed about competition this simply isn’t enough. 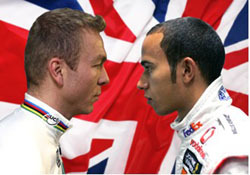 A face-off between the two star athletes has been scheduled at the annual Race of Champions at Wembley. The race will consist of Hamilton and Hoy racing on parallel winding tracks with Hamilton in a Mercedes road car and Hoy on his bike. The race will serve as the opening act for the BBC Sports Personality of the Year awards, which they will both be attending after the exhibition race.